While freerunning and parkour both involve traversing urban obstacles with quickness, skill and grace, there are subtle differences between the two styles of movement. It may be common to see a back flip or a human flag in freerunning, but you won’t see those moves in parkour unless they are needed in order to get from point A to point B.
Parkour is chiefly concerned with efficiency, while freerunning is more about fun and personal style. Whatever your preference, movement offers each individual a chance for self-expression and personal growth. 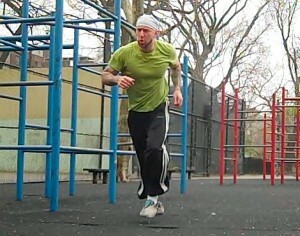 The workouts are about overcoming obstacles, both literal and figurative. Parkour and freerunning can build strength, agility and stamina, but perhaps more importantly, confidence and character. Last spring, when I was beginning parkour, I started by practicing some basic moves like underbars and precision jumping at Tompkins Square Park. As I got more comfortable, I progressed to trying things out in other places. After all, parkour is about adapting to your environment and not feeling restricted by circumstance. Since I love both styles, I’ve been combining different elements from each in my fitness training. We had a beautiful day here in NYC on Monday so I did some freerunning and parkour around the neighborhood, making my way to TSP where I worked on kip-ups, vaults and of course, muscle-ups. At this stage parkour is much too advanced for me, but in future once I get my weight down a lot, I would love to try some of the obstacle jumping maneuvers for variety, and more importantly confidence. Loving your blog, and I’ve watched every one of your videos on YouTube over the past week. Thanks, Max! Keep training and maybe by summertime you’ll be ready to hit the streets and try some freerunning! The way I see it, freerun is just general movement, parkour/running/breakdancing and whatever you feel like so I just always say freerunning as it includes and usually implies Parkour. In the end who cares about what it’s called; I’m glad your still doing it. You should check out one of the jams in NYC. Hey Tim – a name is just a name, right? I went to one of the NYC jams last summer and had a blast. Hope to make it to another one this spring – maybe I’ll see you there!